This is probably the dream of many : what about spending the night in a museum, with all the exhibition rooms to yourself ? The American Museum of Natural History (AMNH) in New York will make this dream come true. On May 5 and June 30, 2017, the AMNH will allow some lucky ones to spend the night surrounded by mummies, dinosaurs, fossils, and taxidermised animals. Night at the Museum derives from the eponymous movie, filmed at the AMNH. The event is available for adults over 21 years old and the experience is priced at 350USD/person (300USD for members of the AMNH). Guests at “the overnight adventure will begin with a champagne reception and music provided by the 12th Night Jazz Trio in the Theodore Roosevelt Memorial Hall. Explorers can expect to roam through the nearly empty halls of the Museum, where they might run into a herd of elephants in the Akeley Hall of African Mammals or come face to face with looming dinosaur skeletons, including a 65-million-year-old Tyrannosaurus Rex. 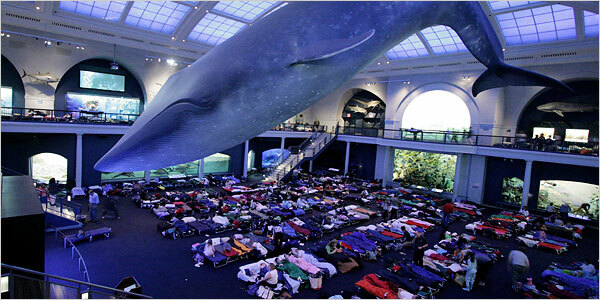 As the evening winds down, guests will be able to unroll their sleeping bags and curl up under the beloved 94-foot-long blue whale in the Milstein Hall of Ocean Life.”. Guests will also be able to visit the special ongoing exhibitions, in this case “Mummies“. We are informed that places are selling quickly so hurry and book your place!